Normally when we see an R/C transmitter used in a build we’re prepared for robots, quadcopters, or UAVs. [Alex] found a new use for his Futaba radio – hooking it up to his Super Nintendo. We’ve seen a lot of builds using game controllers as interfaces to other hardware. The N64 media remote comes to mind, as does the NES iPod dock. Outside of a few builds to automatically win in-game currency for you, we haven’t seen much of anything to control a video game with additional electronics. [Alex]’s build happily bucks that trend, and technically gives the SNES an analog controller. The build uses an mBed microcontroller to capture the radio’s button and stick positions. This is sent through a two shift registers to produce the 16-bit packet required of the SNES controller protocol. [Alex] posted all the software for his build, and from the looks of it the code seems pretty portable. [Alex] says he’s working on getting his Sega Saturn running with his Futaba, so we can’t wait to see some Panzer Dragoon action. 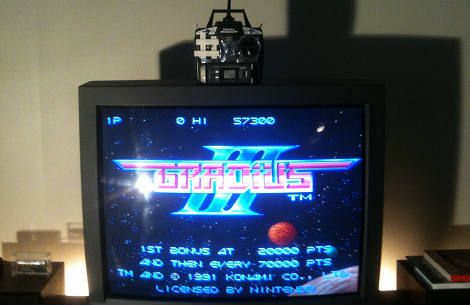 Check out [Alex] demoing his controller with Gradius III after the break. Other than general proof-of-concept, what kind of advantage/additional features has this provided? The original SNES controller did not offer analogue directional movement, how is it going to differentiate “On” or “Off” if the controller hardware originally never could do it. Certainly Nintendo, or some Third party company produced something similar for the SNES, in which case I’ll eat my own words. I guess one thing would be it’s a wireless controller for the SNES – might be more useful than a wired one given the size of screens these days. You could maybe pulse the button presses and adjust the duty cycle to get some kind of analogue approximation. Wouldn’t work well in many cases, but could be handy on some games. Correct me if im wrong but why didn’t he just remap the controler inside of it and then adapt it to be wireless it would be easier and cheaper than this curent setup.